Eindhoven Airport is the transport hub for low-cost airlines Wizzair and Ryanair. Eindhoven train station is ten kilometres (six miles) from Eindhoven Airport. Frequent trains run from Eindhoven to Amsterdam in ninety minutes. The Air Express Bus runs a service from Eindhoven to Amsterdam Central station. But travelling by train is by far your best option. Not only is the train cheaper, it is usually also faster than the Air Express Bus. Eindhoven is not a tourist city. You will find no imposing monument and no canal houses. The city has a relaxed atmosphere, several coffee shops and is certainly good for shopping. Eindhoven is famous for pub crawling. One entire street consists of pubs only. Spend the night in an Eindhoven budget hotel, if you arrive on a late or leave on an early flight. Bus # 401 waits for you outside the airport building. Turn right when you leave the building and buy your ticket (€3) at the bus stop or inside the bus from the vending machine. The trip to Eindhoven Train Station takes twenty minutes. InterCity trains to Amsterdam CS (Centraal Station) leave two minutes past the hour and the half hour from platform five. The first train leaves Eindhoven at 05:32, an the last train is at 23:24. The journey time is one hour and twenty minutes. Get a one-way ticket (€17.50) because return tickets are valid on the day of purchase only. The InterCity train stops at 's-Hertogenbosch, Utrecht Centraal Station and Amsterdam Amstel. The Air Express Bus ticket office is inside the arrivals hall. A return ticket sets you back €42 (bought online €39), single ticket €26 (online €23). You will pay €1.50 reservation fee per ticket, if you book online. The bus stop is right in front of the airport building. The airport bus drops you offat Amsterdam Centraal station. Journey time is just over two hours, but buses do not run as frequently as trains. Most accommodation in Eindhoven is within walking distance of the Railway Station. 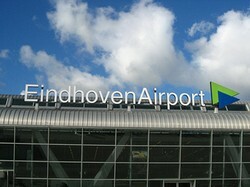 There are not any hotels at Eindhoven Airport. Many hotels are up-market and cater for business people. The number of inexpensive hotels has increased lately and Wizzair and Ryanair travellers will have no difficulty in a finding budget hotel. 1. The best budget place is Backpackers Bed & Breakfast, Stratumsedijk 31, Eindhoven. € 25 per person, shared bathroom, breakfast at € 7.50 and compulsory tourist tax of € 3,50 not included. 2. Second best is Budget Hotel de Zwaan, Wilhelminaplein 4, Eindhoven. € 28 per person, shared bathroom, tourist tax included. Breakfastt at € 6 is not included. 3. Hotel Benno, Wilhelminaplein 9, Eindhoven. Double room from €75 and single from €47.50, breakfast is included. 4. Woonhotel Eindhoven, three locations Leenderweg 285, Leenderweg 201, Boschdijk 167 Eindhoven. €44 for a single with shared bathroom. €74 double room with bathroom, breakfast and tourist tax not included. Backpackers Bed & Breakfast, Hotel de Zwaan and Hotel Benno are within walking distance of the railway station and the bus stop for Eindhoven Airport. Woonhotel is about a thirty-minute walk from to the station and the airport bus stop. Eindhoven is not a tourist destination still there are a few things to see and do. Van Abbemuseum is a favourite with lovers of modern and contemporary art. The collection includes Appel, Picasso and Mondriaan. The museum is compact enough and one to two hours are sufficient to see the complete collection. Eindhoven is also home to PSV Eindhoven. If you want to tour the stadium, book ahead or simply time your stay when a football match is going on. Shopping in Eindhoven is a pleasure. The main shopping area is one minute away from Eindhoven train station. Piazza and Heuvel Galerie are two indoor shopping centers. The neighbouring streets are pedestrian only and lined with well-known brands and department stores – Bijenkorf, Vroom & Dreesmann and Hema. Right in the middle of the shopping area is the Market Square. This is the perfect place to enjoy a coffee with apple pie while you see the world go round. So after Ryanair flight take the direct bus, much faster than bus first and afterwards the train, or if you need to wait over 30 minutes for the next direct bus, take the bus 401 and than the train. I think you forgot to mention the best deal, depending on your landing time. Take the but from the Airport to "Best", the closest railway station from the airport. It is also closer to Amsterdam than the Eindhoven station. Only problem is there is less trains going to Amsterdam. I like Amsterdam a lot. Next time I will have to try Eindhoven. I've never been to Amsterdam, except a brief layover at the airport. I agree with Ramkitten --Wizzair, hmmm. Who would have thought? I've been to Amsterdam once, that time on a ship and the visit was far too short. I'd love to return someday and really explore. This looks like really useful information. Nicely done. And love the name of the airline! I doubt I'll ever make it there, but I think these kinds of travel pages with personal tidbits are so helpful! Great information for travelers. I really enjoyed my visit to Amsterdam when I visited there. It's good to have inside traveler information. Am I looking at that picture right...Wizzair has a pink and purple plane? How fun is that?! The Tuschinski Theatre is an Art Deco cinema in the heart of Amsterdam. It is a lush, velvet, bejewelled tribute to the golden age of cinema!